If you're just about to leave the comfort of Wi-Fi to risk expensive data fees and dead zones — or, you know, get on a plane for 2 hours — you might plan ahead and download some YouTube videos to kill some time. If you're like most people, you still want to see the highest possible quality, so you might have been disappointed that YouTube caps offline downloads at a measly 720p. That may be changing as it looks like the cap will be rising to a cool 1080p in the future. Since there have also been some less significant additions in previous updates that weren't published by themselves, I'm including them below and marking them with the version numbers in which they first appeared. YouTube announced offline playback back in 2013, but it wasn't until more than a year later when it launched as a paid perk for YouTube Premium subscribers (then called YouTube Music Key). At first, offline modes were limited to Normal and HD with resolutions of 360p and 720p video, respectively. Many months later, an even lower 144p mode was also added, and that's how things have remained for the last three years. 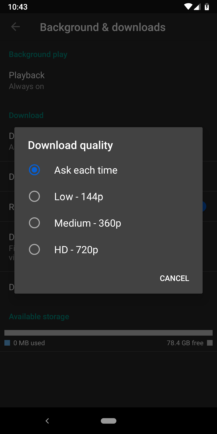 A new option is about to arrive that will see the new maximum quality rising to "Full HD" 1080p. The latest update adds a new line to the list for the Full HD label, and it just happens to also slightly change the formatting of the lines (pictured below). Of course, 1080p probably won't be offered on all phones, particularly those with lower resolution screens or older graphics chips that can't even support that many pixels. 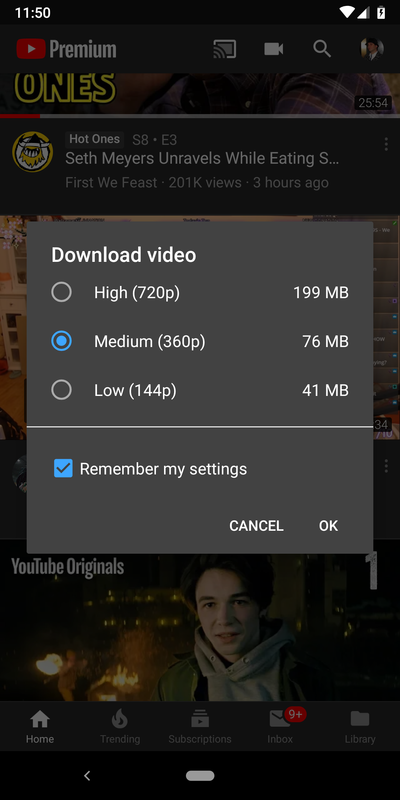 There's also some possibility that YouTube will take into account details like available storage space on a phone when determining if a user should be able to download videos at a higher resolution. The YouTube app currently offers a fair number of notification channels, but it seems that another new channel will be added specifically for notifications related to uploads. If you're not already thinking of pizza and sewers, I'll just tl;dr it by saying this is a reference to the villain's base in Teenage Mutant Ninja Turtles? I'm not really sure why the name is here or what it's for, but a new line was added with the notorious name. I can tell this is related to chat features attached to videos, and there is a control named ChatInlineFixedVideoView that is associated. This may turn out to be something interesting, or it might just be an odd little internal joke, but at the very least, TMNT fans should know they're well-represented within the walls of YouTube. Game streaming has proven itself to be a huge and very profitable market. Twitch is now the 30th most visited site globally, and even achieved 13th place in the United States — not like we should be surprised... You may or may not remember that YouTube launched its own gaming-oriented live streaming service to compete. With it came an app that quickly gained live screen casting. 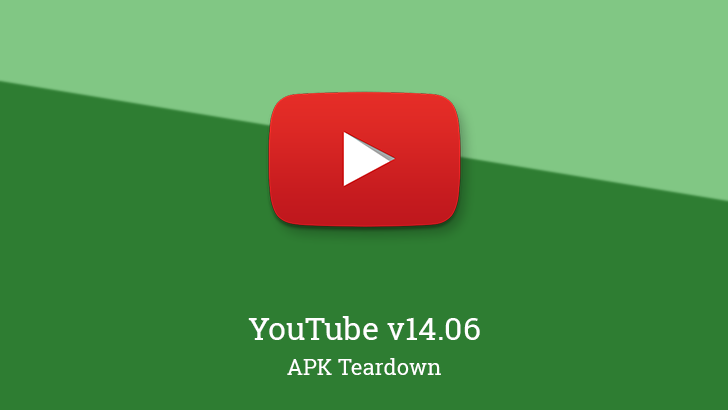 However, YouTube recently announced plans to shut down the separate app and bring everything back to YouTube's main app, which leads us to the latest change. It could have been assumed from the previous announcement, and now the proof is here; screen casting functionality is coming to the regular YouTube app. Newly added Text resembles some of what you would find in the current YouTube Gaming app, describing the functions like screen capture, toggling the mic and camera, and so on. Going live appears to follow the same basic steps as YouTube Gaming. 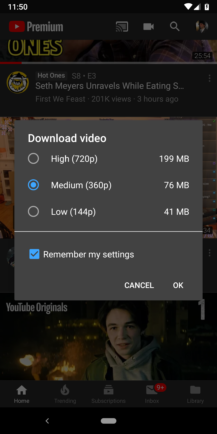 You'll just hit the camera button to prepare a stream, choose to Just like YouTube Gaming, you'll be able to enter the title of a game or perhaps pick one from a list. A few other bits and pieces appear to be missing, like the video resolution, but some of that may either become automatic or the developers might just simply not be finished bringing the functionality over. Since the scheduled shutdown of YouTube Gaming is just about four to eight weeks away — a non-specific day in March — and assuming the main app is expected to fully replace the gaming-oriented version in that span of time, we should presumably expect to see screen recording and broadcasting go live somewhere in that time.